EDITOR’S NOTE: This article originally entitled, ‘List of Former Division 1 Lacrosse Teams’ was originally published October 10, 2011 at 10:25 a.m. It has been repurposed to best serve the lacrosse community. Off the top of my head, I can think of a number of schools like Michigan State, Butler, NC State and UConn, that had NCAA Division I Lacrosse Programs, but now don’t. So I decided to look through some forums, Wikipedia, the NCAA’s website, and a couple of other online resources to compile the list below. It’s not exhaustive, and there are definitely areas where I need some help, but this list provides a pretty sound picture of who used to play lax, but now doesn’t. If you know I got something wrong, I’d appreciate it if you could leave a comment at the bottom of the post (Preferably with a link to the correct info) and I’ll make sure the post is updated with the right stuff!!! I put in 95% of the work… now help me finish the list! READ MORE: Check out our Weekly Watch Guide for upcoming NCAA Lacrosse, National Lacrosse League, NHL and other televised games here. 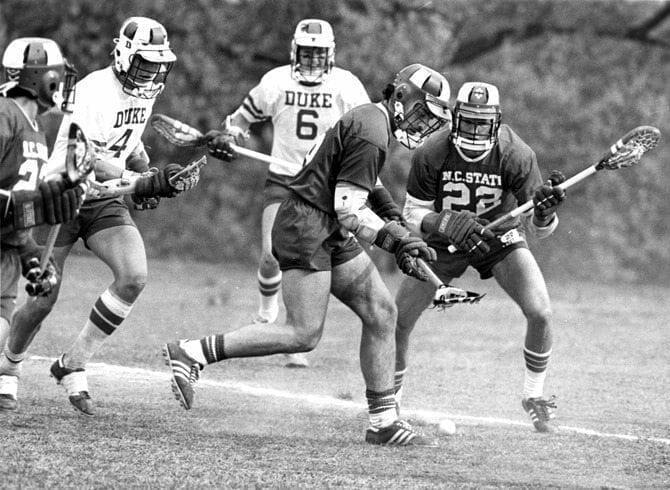 The NCAA began hosting NCAA Championships for Men’s Lacrosse in 1970. The Schools listed directly below were NCAA lacrosse teams. There is an additional list of pre-1970 teams below. Michigan State – Dropped their program in 1995. Michigan has now added D1 lax, and this has to have the Spartans at least considering the move way down the line. Unfortunately, I haven’t heard any rumblings that this is even close to happening. Still, their biggest rival adding lax will only help at MSU. Boston College – Dropped their program in 2002. I grew up outside of Boston and saw a couple of BC games when I was growing up. The school never took the program seriously, let it die out and ended up missing out on a ton of local Massachusetts talent. Lax in the Boston area could support BC’s team nowadays in a major way, but BC is traditional, so they’ll probably just stick with baseball in the Spring. Gannon University – Dropped their program in 1999 I think. The school dropped men’s lax, kept the women’s team, dropped from D1 to D2 and still doesn’t have NCAA men’s lax. Maybe they just don’t think they can compete with Mercyhurst, which is also in Erie, PA? Either way, Gannon is now D2 and out of the equation for D1 lax. Morgan State – Dropped their program in 1981. Morgan State was awesome for a little while, and they were the only historically black college in the country to offer the sport. Kyle Harrison’s dad played there. He wrote the book Ten Bears about MSU. Finally, Morgan State is in Maryland, and considering it is a state school, and lacrosse is the state sport of Maryland, MSU not having a team is a travesty. The club team and alumni are making a strong push to get the program back, but a lot of work remains to be done. University of Connecticut – Dropped their program around 1983. (thanks Dave!) UConn should definitely add lacrosse. They found a way to move their football team up, so they need lax. Connecticut has great lacrosse being played in-state by HS kids, and it is the University’s job to give these kids a place to play in-state. It’s almost as bad as the Morgan State situation because of all the support UConn gave their football team, but not quite. University of New Hampshire – Dropped their program in 1998 or 1999. There was some serious talent at UNH, but never the depth to really compete with the big boys. New England lacrosse has seen a serious bump in the last decade, and if UNH would just drop their D1-AA football team, they could easily support a GREAT men’s lacrosse program. Wishful thinking? Probably. Maybe UNH should follow Vermont’s lead and focus on hockey and lax (to a lesser extent). Butler University – Dropped their program in 2007. This one was a little shocking when it happened, and even more so in retrospect. Butler dropped lax as the game was BOOMING, and the economy was still good. Then we watched their basketball team reach new heights, and it was clear that they were really pushing their athletics. We all wish lax had been part of that equation! Radford University – Dropped their program in 2001. Radford dropped lacrosse and women’s gymnastics, then added women’s swimming. The decision was as questionable then as it is now. The College of William and Mary – I believe they had a D1 program in the 1970s and early 80s. I’m pretty sure they dropped the team in 1982 and blamed Title IX for the cut. Great academic school, regional in the right place for laxers… this seems like a no-brainer for revival someday. North Carolina State– Dropped their program in 1982 I believe. With Duke and UNC being in-state rivals, many people would love to see the Wolfpack revive their program. Names like Cockerton and Nelson still list on the NCAA record books… Nelson went on to star at Cuse! Bowling Green State University – Bowling Green had a men’s varsity lacrosse program from 1965 to 1979 that was one of the most successful lacrosse programs in NCAA history, with a winning percentage of over 75%. Don’t believe me? Watch the video. BGSU Men’s Lacrosse Retrospective from Ay-Ziggy-Zoomba.com on Vimeo. Presbyterian College – Dropped their program in 2010. They started up in 2006 and went 10-63 over that time. Their first D1 win came in 2009. PC cited the fact that other schools in its conference (The Big South) were not going to add lacrosse, so they dropped the program. They kept women’s lacrosse as other BSC schools were either adding or had to plans to add women’s lacrosse. Title IX was not mentioned as a cause. Thanks to Dave for the heads up! Can’t believe I missed this one initially! Washington & Lee – Still a legendary program, but now they compete at the DIII level of NCAA lacrosse along with all of their other sports. This was a drop down that made sense, although they definitely had as compelling a reason to stay in D1 as Hopkins. The University made a choice to be D3, can’t blame them for including Men’s Lax in that move. Kutztown (PA) – I know they had a women’s program, dropped it and then revived it, but they are a D2 school now. Wilkes-Barre (PA) – Not sure if they’re even D1! Kidding, but I know nothing of their lax history. NCLL team, D3 school. Don’t think they ever had D1 lax. Thanks Mike Brand! Georgia Tech – I think they had a varsity team WAY back in the day. Like 1920s. Doesn’t really count. Bowling Green – I still need years for these guys! Replaced above! Thanks Adam! Arizona – Pretty sure this was in the 1960s, before the NCAA Championships. So again, it wouldn’t count as a former NCAA D1 team, but it would be cool to know more. UC Santa Barbara (mid 90s) – Were they virtual varsity then? Seems to be some rumor and confusion here… Great MCLA team now. If I missed anything, made mistakes, etc, please leave a comment with a link to the correct info so we can make this list perfect! GROW THE GAME!